Four & Twenty is a seasonal pie shop and with winter in full spring you can expect to see Salted Caramel Apple, Cranberry Sage, Black Bottom Oat, Black Bottom Lemon, Salty Honey, Grapefruit Custard, Chili Chocolate & Buttermilk Chess among others in regular rotation on the menu. I've been looking forward to trying their Rosemary Shoofly pie and will stop in soon to do so. 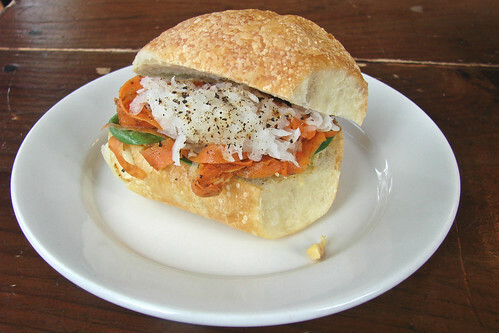 Perhaps while I'm there I'll also snag one of their awesome hummus sandwiches on crusty housemade country rolls. The sandwich is just the right size for pairing with pie without feeling overstuffed. With plenty of spicy pickled carrots, peppery daikon radish and a nice schmear of hummus, it feels like a virtuous sort of lunch that is deserving of dessert. 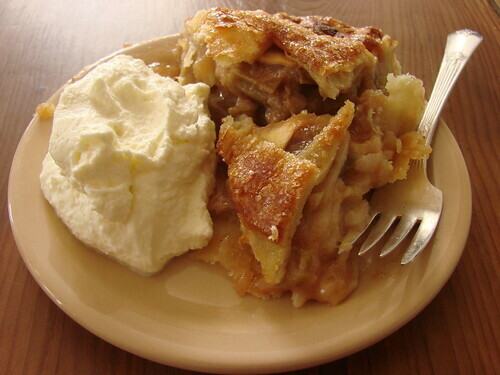 Wow, the apple-rhubarb pie looks amazing ! I love the generous portion of cream. Thanks for sharing ! New York City Beer Week is Happening! A Hot Fudge Sundae With a Cherry on Top, Plz! Ben & Jerry's Liz Lemon Tribute!